Last week, the date for the Scottish independence referendum was announced with at least an attempt at a fanfare. To mark this historic occasion, we revisit some of the arguments made earlier and look at the rhetoric both sides of the debate are using. In representative democracies, those involved in or attempting to manage political power tend to divide themselves into two main camps. One is more forthright and barefaced in representing business interests, the other provides more of a progressive narrative and promise of reforms, but is ultimately just as committed to ‘economic growth’ – the endless pursuit of profit. The camps alternate all the time, and the nature of their division changes, but it’s remarkable how effective this semblance of debate is in maintaining passive support for the smooth running of capitalism and the confusion of any genuine opposition to it. This is a pretty basic socialist argument. As Chomsky puts it, “The smart way to keep people passive and obedient is to strictly limit the spectrum of acceptable opinion, but allow very lively debate within that spectrum […]”. In Scotland, the spectrum of debate is articulated not in the usual parliamentary competition between parties but between the Yes and No coalitions in the Independence debate. Gathering support for their respective positions, the arguments they use are coded with the rhetoric of disempowerment: most importantly for us, discouraging and demobilising autonomous working class organising, the one thing that actually challenges capitalism. It doesn’t take much effort to show this in the Unionists’ propaganda – for years they have succeeded in making sure that a large proportion of working class people are entirely disengaged not only from power politics but apathetic about the possibility of any change. Their strategy is to keep up an ongoing negative assault on the SNP government and its referendum plans, but also on any vision for a different, hopefully better, future. Taking it in turns, ConDem ministers and faceless Labour bureaucrats churn out press releases which the mainstream media gladly lap up and put on the front page. 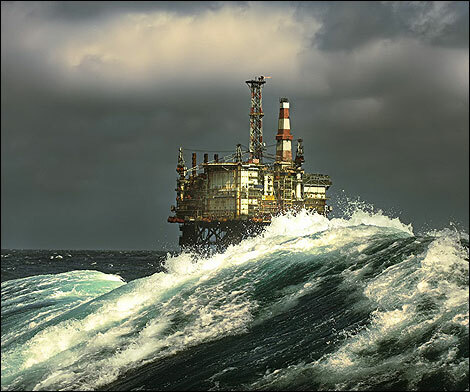 Scotland will be a nation of benefit claimants dependent on a trickle of oil. Plans for defence are a fantasy. You’ll lose aw yer pensions! As Iain MacWhirter puts it, ‘The Unionists are expert at feeding the fear that Scots have of “getting above themselves”’. And this, the message of ‘Who do you think you are, you lowly Scotch prole?’ is coupled with ‘If you think it’s bad now, you’ve seen nothing yet!’. But disempowerment is as much a part of the arguments of the Yes camp. This isn’t to say that Independence doesn’t represent the more ‘progressive’ option in the debate. It offers reforms when their opponents don’t even pretend to (although they might have to, in the end) and this is also its ideological role. Of course, many on the left have excellent reasons for being involved in the Yes campaign and the Radical Independence Conference (RIC): demands for an end to inequality, the fight for feminism and for a sustainable society. An independent Scotland is more likely to grant some reforms in these areas than Westminster, but these will be always be most limited, threatened by erosion and contradicted by the the real power of the economy. The referendum will be the ‘most important decision you are going to make in your lifetime’, as one Yes commentator argues. I don’t know about you, but I think we can make more important decisions. History is meant to bend towards this date. Our present struggles are tied to it, and emptied of their threat. Change will happen, if it’s going to, more than eighteen months from now. ‘Wait until we get rid of Westminster’. In the meantime this is the time of preparation and ‘making the case’ for the big day. The independence-supporting left will be actively involved in grassroots campaigns. But whereas we see organising in these campaigns as being a source of resistance in general, with the potential to spread and grow, they see it as secondary to the constitutional process and part of its propaganda war. In some cases, were independence to be successful, it could remove specific Tory-style injustices, but it couldn’t remove the class antagonism which throws up the need for these campaigns. In an independent Scotland there will be new campaigns and new injustices. We should fight where we stand and make history now. 2) The use of ‘We’. On the 18th September 2014 the people will decide Scotland’s future. We take responsibility for our own country, when we’re able to speak with our own voice, choose our own direction and contribute in our own distinct way. The day we stand on our own two feet to claim a future. Without this ‘we’ the whole independence movement would fall apart. It is the collective, civic national ‘we’, constructed to paper over class differences. In fact, it’s exactly the same as the Tories’ ‘we’re all in this together’ rhetoric, but in a Scottish context. This ‘we’ includes Scottish bosses, managers, politicians, millionaires and their lackies who are and will always fight for their own interests and against ours. But what would it mean for the working class to ‘speak with our own voice, choose our own direction and … stand on our own two feet to claim a future’? Well, for a start it would recognize that we are a class and the struggle between classes, our exploitation and need to resist it, happens whether we want to believe it or not. But we’d be a lot more bloody successful if we did believe it, rejected all cross-class ‘social partnership’ and organised for ourselves. Why wait to do this? For those on the left the choice now seems to be ‘Social Democracy or Barbarism’. Opt for an independent capitalist country with a commitment to state security, reasonably progressive taxation etc. or accept an ever worsening Tory austerity hellhole. The differences between the mainstream Yes Campaign and the left-wing pro-independence campaign aren’t great, but a difference of degree: more social democracy, and not so much reduced corporation tax. RIC supporters share platforms with politicians and endorse similar vague language of ‘democracy’ and ‘equality’, ‘self-determination’ and in their case ‘radicalism’ itself. In asserting this choice, all other options are shut down and deemed unrealistic. Social partnership is now the only thing left. If it’s seen as only a step towards socialism, like all stagism it will only ever manage to create another stage and try to justify why we don’t actually organise directly against capitalism now. If you think that I’m creating a false choice of my own, and that we can work for independence as a progressive step forward and for a future based on social needs without private profit, how is this possible whilst also promoting a national rather than class-based perspective, giving prominence to a future point of change rather than our class struggles here and now, and by accepting the language and ideology of social partnership? By a member of Glasgow AFed. Recently I was accused of being a unionist. The reason for this was due my refusal to set aside criticisms of the radical independence conference (RIC) and get behind the local campaigns of the Leninist, Trotskyist and state socialist left to push for independence as the primary goal for socialists (including myself as an anarchist). I’ll be fair and admit that the other person was mildly inebriated at the time, however as it was another anarchist repeating this hollow “trot dichotomy” between either full support for a yes vote (with no room for nuance or dissent until independence is won) or being a unionist it did enough to irk my anti-state self into writing this post to examine my personal thoughts on the tactics being employed in the name of “radical independence”. I have had it conceded to me during friendly discussion with some of the listed ric supporters that independence will be hard to gain and that any vote is going to be close as there is only a independence/union option on the ballot. If improvement for the people of Scotland through representative democracy was the goal then the SNP would have fought tooth and nail to have two questions on the referendum – the first a yes/no on independence, the second a yes/no for a set of further devolved powers. That way even if the independence vote didn’t go in their favour then Holyrood would almost certainly walk away with powers that could be used for positive social change. So why didn’t they do this? The main reason is that, in spite of what many people have bought into, independence isn’t a struggle between the working and ruling class but is instead a struggle between competing sections of the ruling class over the long-term control of energy resources (oil, wind & tide) and other profitable industries (education, whiskey & fish). Rather than doing this old school, the bosses are using their sway over the working class as the means to settle their dispute. If the nat’s walked away with more powers but not rule they would have to give concessions to the people until next opportunity to take charge rolled around. Rule further down the line would not be on such favourable terms, not to mention years of profiteering being missed for those in charge here and now. To be clear: This vote isn’t about working class power, it is a means for the capitalists to settle an argument amongst themselves. While people are putting their resources toward a shot at independence in a couple of years time austerity is attacking now. People are homeless, starving, dying now. Disability reassessments and workfare schemes are increasing in severity now. Banking on your ability to hold politicians to promises after the count is in is little more than desperately begging for scraps from the table (though I’m sure that any scrap will be held aloft as a marvellous victory for the working class). Not only do we need to tackle problems happening now, but we should also use methods that will foster the kind of change that mean that these problems will be unlikely to repeat themselves. Solutions to our current problems have to help cultivate a truly socialist society further down the line. Independence is just a means of getting two states for the price of one, and once the euphoria of having backed the winning ticket dies down we’ll see the ric message that things can only get better will be exposed as the lie that we have heard many times before and the changes between one set of suits and another will be no change at all. If those on the left want to call themselves radical with any credibility them they would be agitating for changes to be made before the referendum, not after, taking those changes from whoever was willing to implement them. Anarchists often are accused of being unrealistic, however the old adage that a bird in the hand being worth two in the bush seems apt in this situation. If you are going to vote for the politicians then do it after they have given you what you want, not before. Both nat’s and unionists could be giving concessions at the moment, but without any pressure to do something tangible the nat’s have already gone back on their promises before the vote takes place while still securing essential support with nothing more than token lip service. 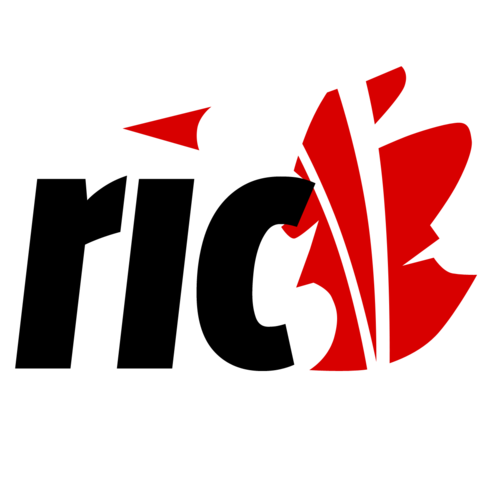 It may seem counter intuitive, but if those participating in ric could have put the matter of independence to one side it could have been used to mobilise the socialist left into a massive anti-austerity pressure group focussed on that nats, withholding a sizeable campaigning/voting block from them and kicking up a stink if they didn’t start a sizeable fight for the people of Scotland NOW. But, as I said above, this isn’t about securing the best for the people or a socialist Scotland; this is a “refined” fight for the control of resources. The first option is that independence will fail to materialize. The lack of a reflexive plan of action coupled with burn-out and disillusionment from many involved in the independence campaign will cause a dip in the campaigning output of socialist groups at precisely the time it needs to be in full swing for fighting austerity measures that are destroying peoples lives. Lots of time will be spent picking up the pieces while our class enemies consolidate their position after two years of our attention being split. I like to call this outcome “Stop the War II – History Repeats Itself” (Do you remember Stop the War? I know some folks at RIC do because they are still clutching at the straws of that one to hoover people up). The second (and less likely) outcome is that the two year of campaigning pay off leaving Scotland is it’s own nation, and while we get a few initial concessions a lot of what is happens is smoke and mirrors and things carry on much as before only this time it is worse because we’ll find that as a smaller nation that we’ll be racing to the bottom in terms of worker’s rights and the regulation of capital interests. The refusal of the RIC campaign to acknowledge that things could have got worse will either lead to campaigners fitting into the new system and justifying to themselves that they haven’t sold out or becoming disillusioned and dropping out of socialist campaigning for good. So what can we, as socialists and anarchists, do now? I say we back community building, anti-Atos and anti-Workfare campaigns that are organised in a collective, directly democratic manner. The Solidarity Federation, IWW branches and groups within the Anarchist Federation have been doing just that, but they are not alone. Claimants unions and solidarity networks up and down the country encourage people to defend themselves and one another from the cuts. Here in Glasgow Unity fights to ensure asylum seekers are treated fairly and works to stop the UKBA practice of dawn raids against families. Social centre projects look to preserve the sense of community that is being destroyed by capitalism and the state. All told we should just be doing all the things we would have done before the spectacle of independence kicked off, and all the things we’d otherwise have to pick up from once the furore dies down a few years from now. Well, that is all I’ve got to say on the subject (at least for now). If you were hoping to find out whether I advocate voting for/against/at all then you are out of luck. 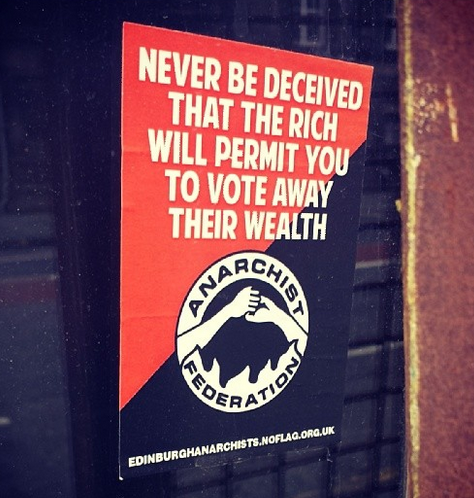 That said the topic has been examined by others on this blog, so go check out this post discussing independence struggles & worker freedom and take a listen to the discussion hosted by Glasgow Anarchist Federation on independence and nationalism. 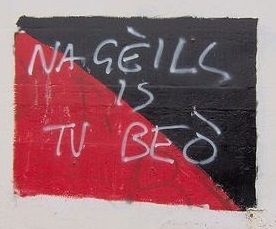 From the Glasgow Anarchists blog.